The third edition of the LVMH Prize for Young Fashion Designers has once again received nearly 1,000 entries from more than 50 countries. 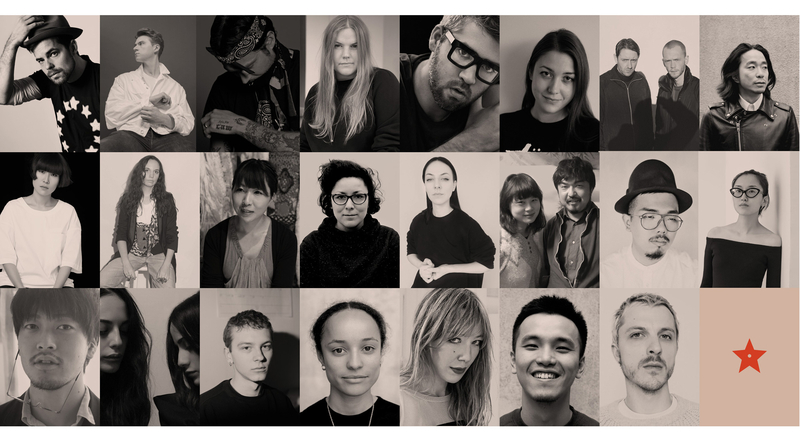 This year, 23 talented young designers have been chosen as semi-finalists by the in-house selection committee, under the supervision of Delphine Arnault, Executive Vice President of Louis Vuitton. Among the fashion designers selected for the third edition of the LVMH Prize, 6 are menswear designers, 7 design both women’s and men’s wear, and 10 are exclusively womenswear designers. In addition, two shortlisted candidates from the 2015 edition, Koché and Astrid Andersen have been selected again this year. Candidates are coming from Japan, China, the United States, Canada, England, Finland, Germany and France, as well as Malaysia and Iran. The 23 shortlisted designers will now be invited to meet our panel of 41 international fashion experts. Eight finalists will be selected on March 2nd and 3rd in Paris. The Jury will award the third annual LVMH Prize for Young Fashion Designers on June 16th at the Fondation Louis Vuitton in Paris. The Graduates’ Prize will continue to accept submissions through May 15th, 2016. Aalto, by Tuomas Merikoski (Finnish designer based in Paris). Womenswear presented in Paris. Alex Mullins, by Alex Mullins (English designer based in London). Menswear presented in London. Alyx, by Matthew Williams (American designer based in New York). Womenswear presented in New York. Astrid Andersen, by Astrid Andersen (Danish designer based in Copenhagen). Menswear presented in London. Brandon Maxwell, by Brandon Maxwell (American designer based in New York). Womenswear presented in New York. Caitlin Price, by Caitlin Price (English designer based in London). Womenswear presented in London. Cottweiler, by Ben Cottrell and Matthew Dainty (English designers based in London). Menswear presented in London. Facetasm, by Hiromichi Ochiai (Japanese designer based in Tokyo). Womenswear and menswear presented in Tokyo. Feng Chen Wang, by Fengchen Wang (Chinese designer based in London). Menswear presented in London and New York. Koché, by Christelle Kocher (French designer based in Paris). Womenswear and menswear presented in Paris. Koike, by Yuko Koike (Japanese designer based in Tokyo). Womenswear presented in Tokyo. Männistö, by Julia Männistö (Finnish designer based in Berlin). Menswear presented in Berlin. Melitta Baumeister, by Melitta Baumeister (German designer based in New York). Womenswear presented in New York. Mikio Sakabe, by Mikio Sakabe and Hsueh Jenfang (Japanese designers based in Tokyo). Womenswear and menswear presented in Tokyo. Moto Guo, by Moto Guo (Malaysian designer based in Kuala Lumpur). Unisexwear presented in Florence and Paris. Ms Min, by Min Liu (Chinese designer based in Xiamen). Womenswear presented in London and Paris. Soshi Otsuki, by Soshi Otsuki (Japanese designer based in Tokyo). Menswear presented in Tokyo. Vaqar, by Shirin and Shiva Vaqar (Iranian designers based in Tehran). Womenswear presented in Tehran. Vejas, by Vejas Kruszewski (Canadian designer based in Toronto). Womenswear and menswear presented in New York. Wales Bonner, by Grace Wales Bonner (English designer based in London). Womenswear and menswear presented in London. Wanda Nylon, by Johanna Senyk (French designer based in Paris). Womenswear presented in Paris. Xu Zhi, by Xuzhi Chen (Chinese designer based in London). Womenswear presented in London. Y/Project, by Glenn Martens (Belgian designer based in Paris). Womenswear and menswear presented in Paris.